Last night, goaded by my sister's comments on the last batch of cookies I made, I decided to tweak the Ultimate Chocolate Chip Cookie recipe. It's not that there is something wrong with the recipe. The fault, I must admit, is entirely mine. I tried out different brands of certain ingredients there because my favorite brands are out of stock in the stores. See, these things are not created equal. It may seem like a small thing but it really does make a world of difference. Anyway. Part of the tweaks I have made was brought about by certain deficiencies in my pantry. This particular batch actually got a thumb's up from my sister so I think it's worth blogging about. First things first. I did not have butter-flavored shortening anymore. So I replaced that with 3/4 cup butter and 1/2 cup less 2 tablespoons margarine. Less 2 tablespoons margarine because I did not like the brand of vanilla that I used the last time (and I still can't find my favorite one) and I intended to use 2 tablespoons of pandan flavored virgin coconut oil instead. Going back to my cookie tweaks, I figured, the cookie might turn out to be too oily if I added coconut oil on top of the original amount of shortening called for, hence the tweak. I ran out of brown sugar,too, and I must have added about 1/4 cup of white sugar to make up for the deficiency. I also replaced 1/2 tsp of the original amount of baking soda with baking powder following the suggestion posted by one of the readers of allrecipes.com to add more height to the cookie. The dry ingredients (flour, baking powder, baking soda and salt), instead of just dumping them all in after I have creamed together the wet ingredients with the sugar, I decided to whisk them all together in a separate bowl to make sure everything is evenly incorporated before I add them in as I do in the Basic Chocolate Chip Cookie recipe. The cookie dough turned out a lot less sticky than the earlier one so I felt the need to pat down the cookie dough mounds into 1/2 inch thickness on the cookie sheet or it might not spread as readily as the earlier dough. As for the baking time, I made sure I keep them in the oven for 13 minutes. They still come out chewy and not crunchy. The result? A lighter-colored and fatter looking cookie that held its shape better than that from the earlier batch. 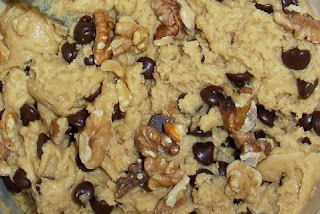 Note: I also was short on chocolate chips so this batch had only a cup of chocolate chips instead of the 2 cups called for in the recipe. 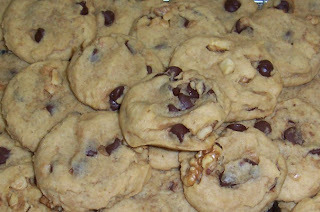 Another note: My sister says although she loved this particular batch, her friends say they liked the cookies from the earlier batch better.